New! Firestarting Gear Made For Your Outdoor Adventure! Consists of 3 rods which are 3" overall including handle. Rods are 2" overall. Two silver rods are magnesium. When ignited this material will burn quickly at a temperature of +5000 degrees. Use a knife to shave a small amount of magnesium into a pile (approximately the size of a nickel) immediately next to or on top of the tinder. The dark color rod is Ferrocium. When scraped with a knife this rod will produce a very hot spark (+1000 degrees). Draw the knife edge at a right angle firmly down the entire length of the ferrocium rod to ignite the pile of magnesium shavings on the tinder. All 3 rods are pressed into a 3/4" black aircraft aluminum machined barrel. 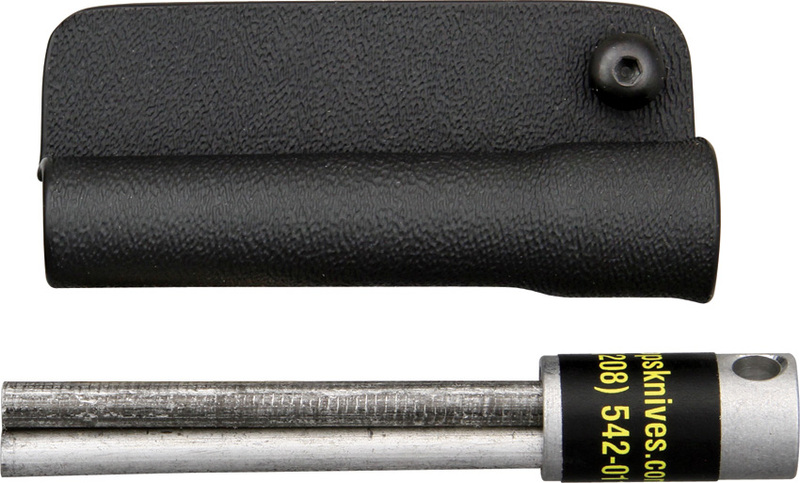 Includes 2 mounting screws to attach to most Kydex sheaths. Made in the USA.